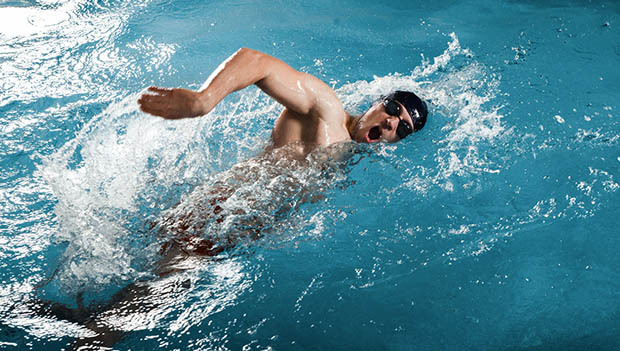 Among the major differences between swimming and land-based sports is that breathing in the water is a skill, and a fairly advanced one at that. Until breathing becomes routine, effective focus on other aspects of the stroke is impossible. But once you master breathing, other skills follow much more rapidly. The number one source of tension and inhibition for new swimmers is the very real fear that water will go up your nose or down your air passages. This fear manifests while trying learning balance positions, which are the non-negotiable first step to good technique. Keeping most of the head submerged while swimming is essential to good balance, but this brings the water perilously close to the nose and mouth. When someone rotates from a nose-down balance position to a nose-up position—the first step in learning efficient breathing mechanics—they have difficulty completing the movement because they're afraid they'll inhale water instead of air. People respond to both fears the same: lifting their head abruptly so the nose and mouth will be at a "safer" distance from the surface. And the instant they do, precious balance and smoothness are lost. Here are some simple steps, which include the Gruneberg Method, that you can take to feel more secure about getting all the air you need, while minimizing your chances of inhaling water. Dip your chin into the water and leave it there while you breathe in through your mouth and out through mouth and nose. Observe how your breath ruffles the surface. Continue for 30 seconds or more until this feels almost meditative. Next, lightly touch your nose and lips to the surface and practice inhaling through the small space at the corners of your mouth. In the mirror, notice the "blotting" created where your nose and lips touch the water. Play at this with a spirit of curiosity for about a minute or until you feel almost "bored" with it. With goggles on, lower your face into the water, keeping your mouth open but without exhaling (see right). Notice how natural air pressure keeps water from entering your nostrils or mouth. As you lift your face, notice how you can inhale easily, even with water dripping around your mouth and nose. In this and subsequent exercises, try to inhale with the tip of your nose still touching the water. Repeat as above, but this time bubble gently from your nose. Watch in the mirror, trying to keep your bubbles small and quiet. The smaller and quieter they are, the longer you'll be able to sustain one exhale, before lifting to inhale again. Repeat this but bubbling only from your mouth. When you can do each of the above in a calm and contained manner, advance to "rhythmic breathing." Lower your face and bubble out for a count of four or five-one-thousand. Lift and inhale for a count of one-one-thousand. Lower and repeat. For an interesting challenge, alternate between mouth bubbles on one exhale and nose bubbles on the next. Your goal is to inhale with the tip of your nose—and perhaps even your nostrils—still in the water and your mouth barely clearing it. Repeat until you develop a relaxed and seamless rhythm.